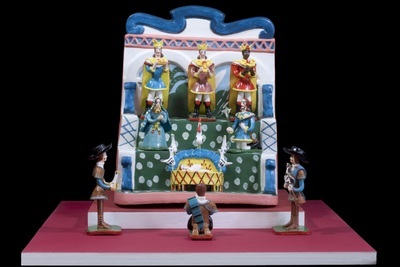 The typical Estromoz nativity attributed to José Maria de Sá Lemos (~1920) is built like an altar or shrine. It is a miniature version of the large staircase altars or thrones erected on festivals of popular saints. The three-tiered altar allows for a limited number of figures, ordinarily nine altogether. Following a traditional order, the kings are at the top, the Holy Family is in the middle, and the shepherds are on the lowest level. The golden rule is order and symmetry; only color and costumes are left to the imagination. Handpainted terracotta figurines depicting the nativity of Jesus. Exhibition label originally written by Fr. Johann G. Roten, S.M. for exhibit entitled "Elisabeth's Nativity House: The van Mullekom Collection" held at Roesch Library, University of Dayton.